"The Daleks have devised a plan that will deliver a decisive victory. General Landen and her fleet are all that stand in their way. And then there's Kade… "
What did you think? Did it all wrap up well? Which was your favorite part of this series? The Daleks had a pretty cool plan here. They pretty much could have taken out the whole solar system without taking a shot, and that's pretty amazing. I think the little rivalry between Kade and Landen makes for a good element of the story. I was really surprised by the ending though, even with all Landen had done, I wouldn't expect Kade to turn sort of turn on her in that fashion. Not enough to kill her, but still. Just sort of a sad story at the end of it. I liked that it looped back to Suz's "Death to the daleks" message, it helps bring the stories together pretty well. 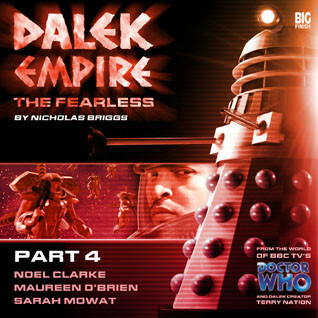 I really liked the conclusion of this, and certainly hope there's a Dalek Empire V. All four of these were really fun to listen to and just really well produced. The plot was only able to go so far since it was stuck in the middle of Dalek Empire. Yet it was still rewarding to hear Suz shout Death to the Daleks! I thought the character of Kade was a bit too overwritten at times. We really didn't need all the dialog praising him to such a degree or so many people talking about what sort of person he is. Yet I suppose it does fit with them trying to shape him into the soldier they want. I found the ending to be really good. Another strong story, but really it was Noel Clarke who rocked this one. I asked Nic Briggs at GenCon if there was any plans for Dalek Empire V and he said there wasn't, but if we want one we should start campaigning. Well? Have at it!